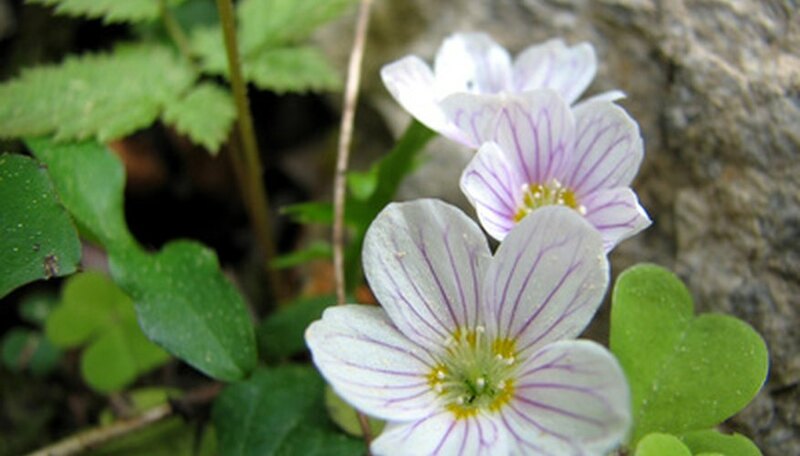 Although it is often said that the shamrock plant won't grow in any but Irish soil, you can have the luck of the Irish and plant shamrock (Oxalis) in your own yard. The shamrock plant isn't difficult to grow, and the bright green leaves and delicate white flowers will look lovely along a border, or in a patio container or hanging basket. Most varieties of shamrock aren't tolerant of cold weather, so if you live in a climate with freezing winters, bring your shamrock plant indoors when the temperatures begin to drop in autumn. Plant shamrock in full sunlight. Although the shamrock will grow in partial shade, full sunlight will bring out the colors in the leaves and flowers. Be sure the planting site has well-drained soil, and avoid planting the shamrock where rainwater puddles for more than three or four hours. Keep the soil moist, and don't allow it to dry out. The soil should be damp, but never soggy, as the shamrock plant will rot in too much moisture. Feed the shamrock plant weekly with a general purpose liquid fertilizer. Dilute the fertilizer to half of the strength recommended on the package. Bring the shamrock plant indoors before the weather freezes in autumn. If the shamrock is planted in the ground, re-pot it into a container filled with commercial potting soil. Be sure the container has bottom drainage, and never allow the bottom of the container to remain in standing water. Put the shamrock in a sunny window, and move it outdoors when the danger of frost has passed in the spring. Divide the shamrock plant every two to three years, or when the plant begins to look crowded. Dig the shamrock with a shovel or a garden fork, and using your fingers, divide the tubers into smaller sections. Discard any old or diseased sections, and re-plant the shamrock plants.